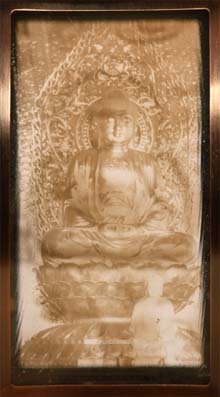 The two pieces of glass were first coated with a thin film of gelatin, and then a liquid photo emulsion, Liquid Light, was brushed on. 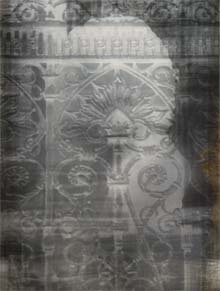 The glass was then exposed to black and white negitives in the darkroom. They are displayed in an open-backed frame that can hold multiple pieces of glass separated slightly from each other. The light shines from the back illuminating the caged lion. 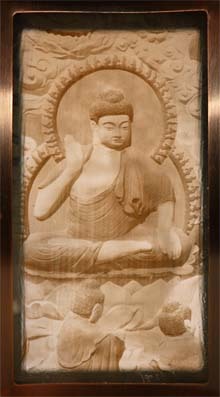 Printed using Liquid Light on glass, as explained above. 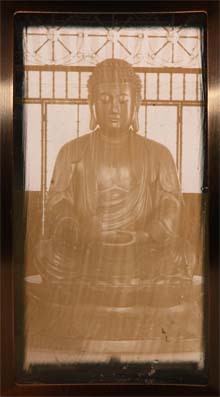 The four images of Buddha were taken in various temples in Malaysia using a Canon AE-1. 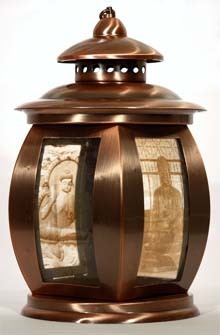 The idea of an inner light is personified through the lighting of this lantern. 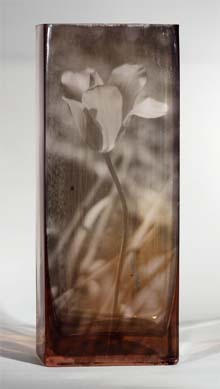 Rose colored vase coated with Liquid Light and exposed to black and white negitive in the darkroom. The vase holds its own flower.